After the discovery of iron and its uses 2,500 year ago, the social organization of African society changed. Many of the inhabitants, who had been nomads since time out of mind, became sedentary. Castes formed, and among them the blacksmith was found at the centre of all craft activities and became powerful. Without him there would be no weapons for hunting, nor farming implements, nor cooking utensils. He was master of fire and wood. Traditionally, it was he who sculpted the shell of the djembe, or the slats of the balafon. The balafola's gesture is the same as the blacksmith's. Beating with the stick is the same movement as with the hammer and the slat replaces the anvil. Everything seems to indicate that the first balafon players were smiths. According to one of the Mandingo cosmogonic myths, the first inhabitant of the Earth coming down from the sky was a blacksmith. It is certainly not by chance that the balafon played an important part in the history of the accession of the kingdom of Mali in the 13th century. The history of the balafon, sung and recounted by the Jelis for eight centuries, is written in an epic that is comparable to India's Mahabharata, or the song of the Nibelungen in Germany. At the end of the 12th century, Nare Maghann Konate reigned over the Mande country, a region that at the time covered today's south east Mali and north Guinea. This king had two sons, Soundiata Keita was born in 1190 in Niani by his first wife and Dankaran Touman by his second wife. When the king died, it was the second son, Dankaran Touman who, with his mother behind him, took over power in place of his elder brother and legitimate heir Soundiata. Soundiata went into exile with a few faithful followers and travelled all over the country to forge alliances with clan chiefs. Just before his death, Nare Maghann Konate had foreseen this situation. He named Bala Faseke, the son of his own Jeli as counsellor to Soundiata. He thought that with his political acumen, he would be able to help his elder son to resume the power usurped by his half-brother. In the south of the country was another kingdom, Sosso. This realm was governed by a blacksmith king Soumaoro Kante with an iron hand. This king, encouraged by desire for grandeur, annexed the surrounding small kingdoms one after the other and coveted the Mande country for its huge gold resources. The young Mandingo king, Dankaran Touman, alarmed by the ambitions of his neighbour, sent his Jeli, Bala Faseke to the court of the Sosso King with instructions to try to mediate between the two kingdoms. But Soumaoro Kante imprisoned him and thus violated the ancestral custom of respecting the Jeli. The legend is that it was Soumaoro Kante who met the Dondori imps one day. They showed him an instrument he had never seen before: the balafon! Soumaoro Kante wanted to remain the master of this fantastic instrument. None but he had the right to touch it. If by chance, anyone else played it, he was summarily executed. To emphasise this interdiction, he said, "If a fly lands on it, it shall be found and killed." One day, in defiance of this prohibition, Bala Faseke penetrated the secret room where the balafon was kept and began to play it. Even though he was out in the bush hunting, Soumaoro heard the sound of the balafon. He returned home at once in a rage and was about to kill the Jeli, but Bala Faseke spellbound Soumaoro by singing his praises. He played with such virtuosity that the king was charmed by the music and appointed him as his personal Jeli. War between Soundiata Keita and Soumaoro Kante seemed inevitable. After several inconclusive battles, 1235 saw the battle of Kirina. In the morning, before hostilities commenced, Bala Faseke succeeded in fleeing back to his original master, Soundiata Keita. Thanks to the regained support of his Jeli, Soundiata won the war and became the first "Mansa", king of Mali. His reign was the start of a long period of prosperity for Mali, which lasted from the 13th to the 16th century. That was the apogee of the balafon! Each king or village chief would have his Jeli who could exercise his function and develop his art without material care. Following the defeat of Soumaoro Kante, Bala Faseke played the balafon during the great ceremonies for a long time. Soundiata named him Bala Faseke Kouyate. That was the foundation of a long line of Griots: the Kouyates, who are still the guardians of this balafon known as the Sosso-Balafon that can be found at Niagassolo, in the north of Guinea. In 2004, UNESCO added the balafon to the world heritage list. Amongst thousands of percussion instruments, there is an important family, the mallet instruments. 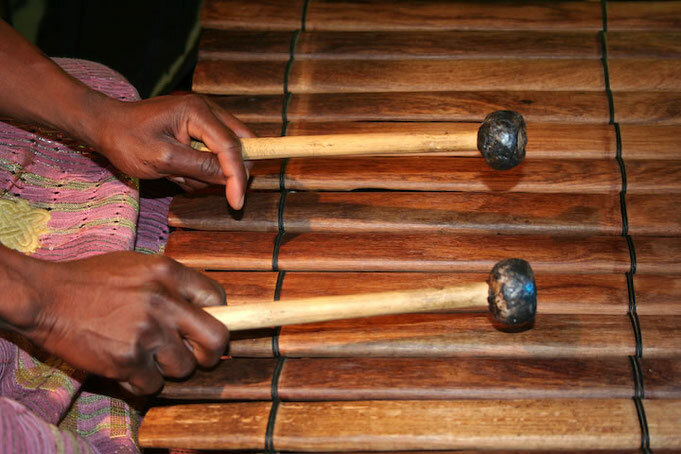 Xylophones, vibraphones, marimbas, metallophones, glockenspiels have a common ancestor - the African balafon. The culture of balafon music is highly developed in the countries south of the Sahara desert (Sahel zone) and the tropical rain forest. In the 16th century, it became a real art at the royal court of Sikasso/Mali and was flourishing under the reign of a generous king. Being nourished and housed, the musicians developed virtuosity and founded a music tradition. 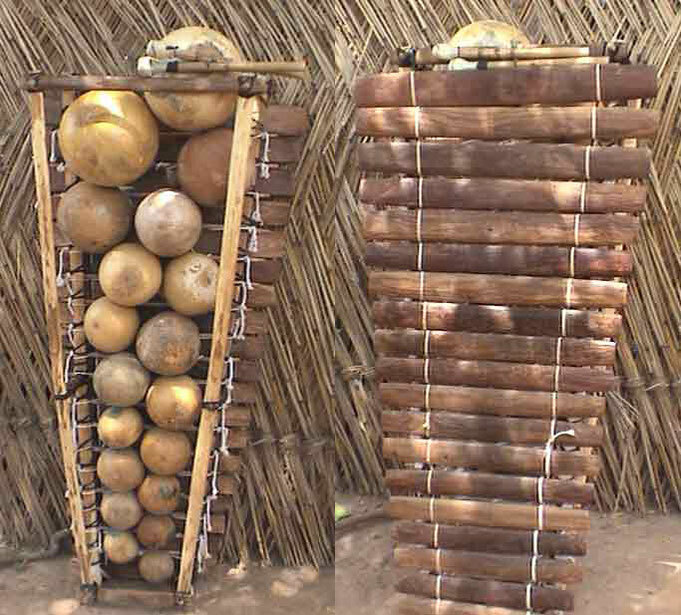 The balafon consists of wooden mallets and calabashes - hollow pumpkins - serving as resonance-boxes. 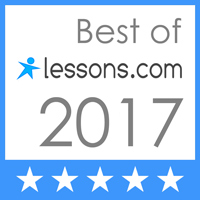 Their volumes correspond to their notes. There are two or three holes in each calabash, covered by spider webs or bat wings, nowadays more and more by ...cigarette-paper. These membranes vibrate with the resonance, which creates a rustling sound, a so-called mirliton effect. This effect is accentuated by the sound of metal bracelets attached to the player's wrist. Mallets and resonators are fixed on a frame of wood sticks and strings made of goat's skin. In Guinea, Nigeria, Chad and Kenya are the pit-resonated xylophones. The slats are placed over holes dug in the ground. The Makonde, Wayao and Wazaramo people in Tanzania play a type of marimba with one large resonator. In Eastern Cameroon, the ethnic Fang play with six mendjans, xylophones with different registers (bass, alto, tenor, soprano) that make up a real orchestra, the komendjan. The Fangs in Gabon play the mendjan me biang. The Bamileke, people from the north-west of Cameroon play the djein, a xylophone with big slats laid across banana trunks. In Chad, the Sarah and Sarakabas play the kundu xylophone.